I’ve been a fan of Resurrection Eggs for Easter for many years. I started using them years ago with the young women in Teen MOPS (Mothers of Preschoolers). Many of these young women had never heard the TRUE Easter story, and it was a great way to share the gospel in a fun and non-threatening way. 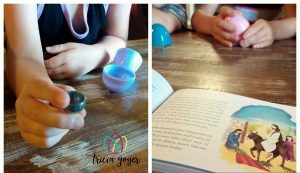 I’ve always been excited to use Resurrection Eggs with my kids. When they were younger, ages six, four, and three, I decided it would be too hard to do them all in one day (because of their attention span), so we used them over Easter week. My kids loved the eggs. They enjoyed opening them and revealing the object. They loved hearing the story of Jesus. And it opened up great conversations. For example, most children’s Bibles or storybooks do not talk much about Judas’ betrayal of Jesus, but the coins in the second day revealed the true motives of Judas’ heart. If you’re looking for a fun and insightful way to share the gospel go to your local Christian bookstore and pick up Resurrection Eggs! Rediscover a perennial Easter classic: Resurrection Eggs! 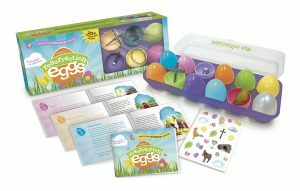 Each of these twelve colorful plastic eggs holds a different memory-grabbing object to take Jesus’ journey to the cross and beyond right into children’s hearts—from home to the classroom to the neighborhood hunt. The English/Spanish bilingual booklet uses simple language for children. 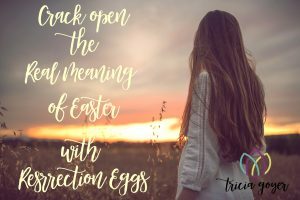 Discover how the anticipation, surprise, and experience of Resurrection Eggs has helped Easter come alive for children around the globe. Do you have special gifts you give in celebration of Easter? 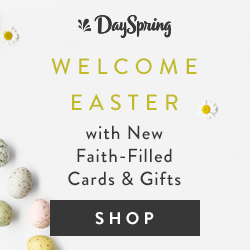 Dayspring has beautiful cards and gifts to help you share the joy of the resurrection this Easter!